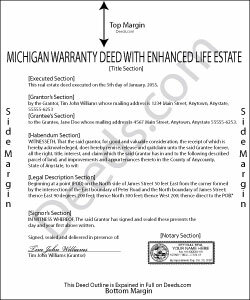 A warranty deed with enhanced life estate is sometimes referred to as a ladybird deed. When correctly executed and recorded, this deed provides the structure for a non-testamentary transfer of real property. Leaving the real property out of a will allows the transfer to occur without the need for probate. The grantor conveys the real estate back to herself, but reserves a life estate with full power to sell, mortgage, change the beneficiary, or otherwise use the property with no penalty for waste or obligation to inform the beneficiary. When the grantor dies, the property rights, if still available, transfer to the default beneficiary. To finalize the conveyance, the beneficiary must file a property transfer affidavit within 45 days of the grantor's death. Submit the form to the assessor's office located in the same county as the real estate. Lisa D. said: It was an easy site to use and very a good price. Thank you!! Pamela G. said: This is an easily navigated site and the forms came with detailed directions. I have already recommended Deeds.com to a family member. Reply from Staff: Thank you so much Pamela, we really appreciate it! Susan K. said: Very helpful; information included on the form explanations about Colorado laws in regards to beneficiary deeds helped us understand the issues involved. Jim J. said: The forms were easy to use and the fields are tabbed so that you can enter your information and then move quickly to the next entry. The Guide for the documents was very helpful. Reply from Staff: Thanks Jim, we appreciate your feedback. Stephanie G. said: Wonderful. Easier to fill out this form than I thought it would be.